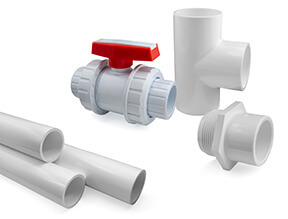 Our industrial PVC pipe and fittings are manufactured in both inch and metric industry standards and conform to all relevant British and DIN specifications. What is the difference between PVC and PVCU? PVC is the common popular term used to describe any plastic made from the polyvinyl-chloride. The "U" part of PVC denotes that it is “Un-plasticised” and so has not had a plasticiser added to it to make it soft (eg: for tarpaulins) so more correctly, any rigid PVC product, like pipe, should be termed UPVC or PVCU. Most people however just call it PVC. Is PVC (PVCU) pipe safe for drinking water? Most countries have their own standards and testing systems for approval of items for use in potable water supplies. In the UK, products are tested by independent laboratories and then the results are submitted for WRAS approval (other such standards include NSF in USA, KIWA in Europe). All our PVC pipe and fittings are WRAS approved. Is PVC (PVCU) pipe food safe? Food safety of a material is a very generic term as it depends what the food is. The WRAS approval shows that it is safe for drinking water, and this would also apply to most foodstuffs. For highly concentrated aggressive or oily ingredients however, the chemical resistance table should be checked. Is PVC pipe safe for my marine aquarium? WRAS approved PVC pipe is ideal for aquariums as it does not leach anything into the water. Care should be taken during the construction of the pipe system and at least 24 hours allowed for the cement to properly cure. A new pipe system should always be flushed with non-aquarium water first to remove any residues from the cement curing process. 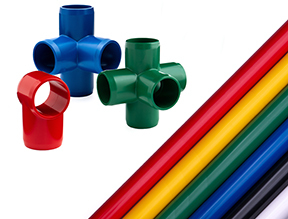 PVC pipe and fittings are suited to many applications. They are probably the most widely used of all plastic pipe systems in industrial pressure applications and you will find them in the water treatment, swimming pool, cooling, heating, electroplating chemical and process industries to name but a few. PVC (PVCU) pipe systems are widely used in agriculture and horticulture for drip and spray irrigation of glasshouses and polytunnels, farm slurry handling systems and also for water supply around animal husbandry units. Many on farm biogas systems also use PVC pipe for waste and low pressure gas transfer. PVC pipes find their way into many other non-industrial applications. You will often find them in lots of domestic locations where PVC is the top material of choice for ponds, hot tubs, pools, home irrigation systems and marine aquariums. PVC pressure pipes are often confused with waste pipes. The sizes for sinks, baths, gutters etc. are a lighter weight plastic as they do not need to handle pressure and are not compatible with pressure pipe. PVC pipe has a recommended operating temperature of 0 - 60 degrees centigrade (32 - 140°F). It should always be borne in mind that the pressure rating of a PVCU pipe drops with rising temperature. PVC pipe is connected either by solvent cement welding or threading. Solvent welding, the most common method, involves cleaning and then painting a cement onto the pipe and socket, before pushing together to make a permanent bond. Threading PVCU pipe involves using a thread sealant like PTFE tape, winding it round the male part of the thread and then screwing together. 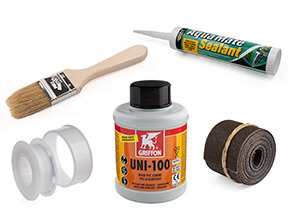 Threading of UPVC pipe is more likely to result in leaks than solvent welding. See our video on How to solvent weld PVC Pipe. If you do find a leak in a joint that you have made, it may require the section of pipe to be cut out and replaced. Some fitters find that if they can introduce a small vacuum to the pipe system, they can paint solvent cement around where the leak is and it will draw the cement in a seal the leak. PVC has a good abrasion resistance but not as good as ABS pipe. PVC pipe is rigid and is not designed to be flexible. It has little or no flexibility especially in larger sizes. If the PVC pipe is used for air or blown particles, the pipe wall can build up static electricity which can arc to nearby earthed objects and become a fire hazard or health and safety issue for pipe workers. It is generally recommended that PVC is not used for air. If PVCU pipe is used in such an instance, areas being worked on should be sprayed with a 50/50 detergent solution, which will prevent shocks to the workers. ABS is a preferred plastic for blown or compressed air. The WRAS approval of our PVC pipe and fittings means that they have been tested as safe for drinking water. PVCU pipe is non-toxic. Food safety is a very complicated term. As to whether PVC pipe is food safe depends very much on the type of food and the concentration of the ingredients. Although our PVC pipe is WRAS approved for drinking water, the chemical resistance data (below) should be checked to ensure food safety. Good with most acids, alkalis and salts but PVC pipe is poor with aromatic and chlorinated hydrocarbons. You can find more information on our PVC Pipe Chemical Compatibility Chart. If you unsure about a chemical you are using, it is best to ring us and we will be happy to advise and find a solution for you. Correct spacing of pipe clips is essential in PVC pipe systems to ensure there is no undue stress on the pipe. For recommended measurements see the Pipe Clip Spacings Table. 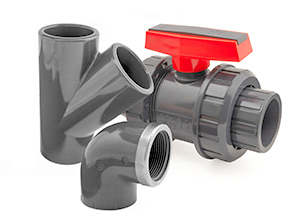 The dimensions of our pipe and fittings conform to BS and DIN Standards. See Imperial PVC Pipe Dimension Tables and Metric PVC Pipe Dimension Tables for more information. As temperature increases, the pressure rating of the pipe decreases. See Pressure Derating Table for how to calculate. 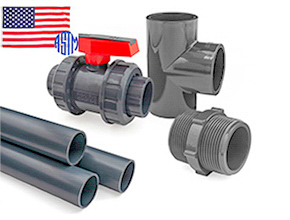 These PVC pipe and fittings are typically found in North America and the UK. They use a measurement, denoted in inches, which is based on the "approximate bore" (also referred to as the "nominal bore") of the PVCU pipe. For example, a 2" PVC pipe will have a "nominal bore" of 2 inches, but the likelihood is that nothing on the plastic piping system will measure exactly 2 inches! The outside diameter of a plastic PVC pipe is the one which is 100% consistent and the one which is controlled along its length during manufacture. During the extrusion manufacture process of PVC pipe, the soft plastic tube passes through a temperature-controlled cooling bath. As plastic shrinks as it cools, only one dimension of the PVC pipe, the inner or the outer, can be accurately controlled. The option is made to control the outside diameter of the pipe so that when fitting a PVC pipe into a PVC fitting, the pipe will always be a good fit. The wall thickness of PVC pipe changes with the pressure rating (it is thicker for high pressure pipe and thinner for low pressure pipe), but the outside diameter must always measure the same so that the pipe and fittings will marry up together properly. This left the original PVC pipe design engineers with a problem. They were used to doing their calculations for flow based on the inside diameter of a pipe, as this governed the flow and head-loss characteristics. PVC pipe, however, was manufactured with a fixed outside diameter. In order to find a solution, they set out a range of standards which ensured that if a pipework engineer was doing his calculations, a 2" pipe would have a bore of approximately 2", which would make his calculations easier. What that meant, was that the outside diameter of a 2" pipe would have to be quite a bit larger, as it had to be ensured that, even with the highest-pressure rating of pipe (with the thickest wall), the inside diameter was still in the region of 2". In fact, if we take our 2” PVC pipe as an example, all standard 2” PVC pipe has an internal diameter of greater than 2”, which means that all flow calculations err on the side of safety. 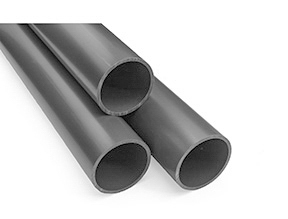 The exception to this is very thick-walled pipe, such as Schedule 120 PVC pipe, which is designed for very high-pressure applications and in particular threading. As a result, the standard outside diameter of 2" PVC pipe ended up at 60.3mm, which is 2.37". Rather confusingly, this then meant that 1 1/2" PVC pipe, like all imperial pipe, also has a larger standard outside diameter than 1 1/2", and this measurement ended up at 48.3mm (or 1.9 inches) - which is almost 2"! 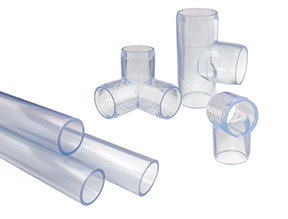 Our standard 1/2" to 4" imperial PVCU pipe is supplied in 5m lengths with plain ends. Other sizes are supplied in 6m lengths, also with plain ends. Class 7 PVC pipe is supplied in 3m lengths. The table below shows the different wall thicknesses and internal bores. 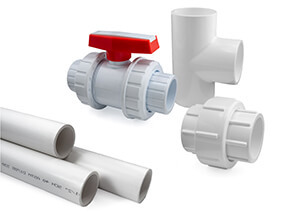 The metric PVC pipe and fitting system was developed much later than the imperial PVC pipe and fitting system (above). It was also developed, some would say, with a bit more sense. Like the imperial pipe and fittings, the controlled diameter of the PVC pipe during manufacture is still the outside diameter, and so this remains consistent throughout different pressure ratings. However, unlike the inch sizes of PVC pipe, the outside diameter of the pipe is the stated diameter of the pipe. So, a 63mm PVCU pipe will always measure 63mm on the outside diameter, a 32mm PVCU pipe will measure 32mm on the outside diameter etc. etc. The bore of mm sizes of PVC pipe varies with the pressure rating. 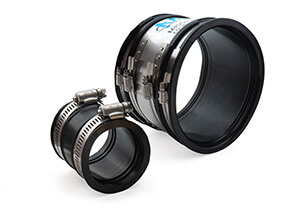 A higher-pressure rating means a thicker tube wall and so a smaller internal diameter. As mentioned above, getting the correct size of PVC pipe can sometimes be a challenge. To avoid confusion, you should ALWAYS measure your PVC pipe in millimetres and not in inches. If you are at all unsure about which is the correct pipe size for you, it is always best to call us and we will help you find the best solution for your application. 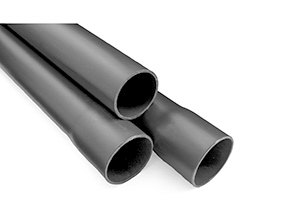 Our metric PVC pipe is supplied in 5m lengths with a socket moulded on the end. The exception to this is 16mm pipe, which is plain ended 5m lengths, and sizes of 225mm and over, which are also plain ended but in 6m lengths. The pressure rating of PVC pipe reduces with increasing temperature. Multiply the pressure rating of the PVC pipe by the ′De-Rating Multiple′ to get the actual pressure rating at that operating temperature. For example, a 9 bar pipe operating at 30°C will be 9 x 0.8 = 7.2bar. These spacings between pipe clips are given on the assumption that the PVC pipe is carrying water at 20°C and 40°C. For lighter loads, the spacing could be extended, and for heavier loads, the pipe clips could be positioned closer together. Be sure to provide additional support either side of elbows, bends and in sections of PVC pipe with heavy items such as valves, flange sets etc. At 60°C, continuous support is necessary. Ratings are given in terms of the suitability of PVCU pipe to carry a specific chemical. For some chemicals no reliable data is available and so no data is given. • The effect of any chemical on PVC pipe systems may be dependent on factors such as temperature, pressure, concentrations and abrasiveness. Materials should be tested under actual conditions to determine the suitability for a specific application. • This information has been supplied to Plastic Pipe Shop Ltd by its suppliers and from other reputable sources. The information should only be used as a guide. • The ratings for each chemical are based on a period of 48-hour exposure of the PVC pipe. • Plastic Pipe Shop Ltd does not guarantee (neither express or implied) that this information is accurate or complete. Further Plastic Pipe Shop Ltd does not by way of this information make any recommendation that any material is suitable for any purpose. Bronze Plating: Cu-Cd Bronze Bath R.T.
Copper Plating (Acid): Copper Sulfate Bath R.T.
Zinc Plating: Acid Fluoborate Bath R.T.
Zinc Plating: Alkaline Cyanide Bath R.T.
WRAS (Water Regulations Advisory Service) is the body that grants approvals for components and materials to be used in drinking water (potable water) systems in the UK. There are two different types of approval: materials and product. PVC pipe and fittings fall into the materials section as they are static products. All our PVC components are covered under WRAS approvals and are re-tested every 5 years to ensure we, and our suppliers, still comply. To attain WRAS compliance the materials are tested by soaking in a water bath for a period and then testing the water for chemical presence, which, if present, would indicate leaching from the plastics tested. This is carried out by a small number of very specialised laboratories. All our PVC testing is carried out by the Thames Water Quality Testing Laboratory in London. We are often asked the question "where can I buy PVC pipe near me?" or maybe you are looking to find a same day collection or next day delivery. In the UK, PVC pressure pipe is not available in DIY or most trade plumbing stores. 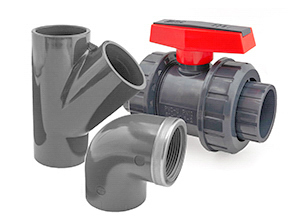 Although there are a small handful of specialist pipe suppliers who stock a decent range of fittings, the best place to find PVCU pipe is through online suppliers. Online stockists like us tend to stock a far greater range of parts, pipes and tubes and can send them out by courier with a variety of different options including next working day, am (morning or pre-noon) or even same working day if you are desperate for them. Plastic Pipe Shop are one of the top UK suppliers and also one of the largest UK stockists of PVC pipe systems. Although >95% of our parts are sent out with carriers to all over the UK, we also operate a trade counter at our warehouses in Stirling. If you visit our warehouses, our staff will be happy to show you any parts and discuss your requirements and plans with you. Plastic pipe is much more prone to expansion and contraction with changes in temperature than metal pipes such as copper and steel. In situations where there are long pipe lengths being installed, it is necessary to ensure that precautions are made to allow for contraction and expansion. A failure to consider this can result in the PVC pipe becoming stressed as it tries to expand or contract, but the installation will not allow it. By clipping the pipe hard, you will not stop the expansion or contraction, you will merely direct the forces of it to a different section of the pipe which can sometimes result in breakage of the pipe. The coefficient of linear expansion of PVC pipe is 7.8 x 10-5m/m.°C. This is nearly twice that of copper and three times that of mild steel. Using this value, a 20m length of pipe will expand 4mm with a 25°C rise. This may not sound a lot, but if the pipe is clipped hard at either end the expansion power has to go somewhere! The calculation for this can be found at The Engineering Toolbox.